Grapes are an amazingly versatile fruit that makes up many of our favorites from grape jelly to wine. 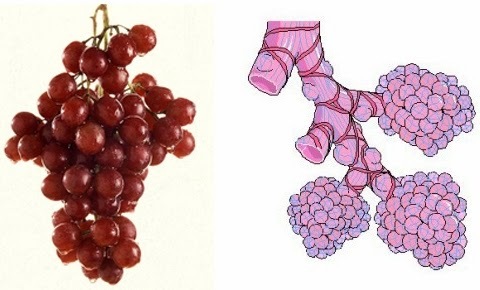 When it comes to the body part(s) that they look like and help nourish the most, grapes resemble the alveoli of the lungs. The lungs are made of branches of ever-smaller airways that finish up with tiny branches of tissue called alveoli. These structures allow oxygen to pass from the lungs to the blood stream. A diet high in fresh grapes has shown to reduce the risk of lung cancer and emphysema. Grapes also help to treat respiratory ailments like asthma and damage that can happen from chemical exposures. Grapes help the lungs to retain moisture, thus preventing lungs from inflammations, dryness, and other factors that can lead to damage. Grapes act as a good expectorant and supports the tone of the lungs. Grapes also, in a cluster, look like the heart and supports heart health with it’s dense nutrition. Rich in antioxidants, grapes reduce the risk of hypertension and plaque formation in the arteries. Grapes help in the generation of nitric oxide in the body, which improves heart health. Have you tried the new grapes that taste like cotton candy? OMG!!! SOOOO YUMMMM!!! Grapes are also great frozen on a hot summer day! Course chop ingredients and add to blender. Add water to cover ingredients and blend. Add ice, more water, stevia, himalayan salt, any of these to taste. LOVE yourself and eat lots of grapes! Be sure to leave your thoughts below and let us know what else you’d like to hear more about.